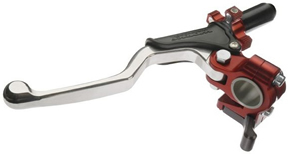 The clutch lever is CNC’d from solid billet aluminum. The lever incorporates three sealed bearings and a large 8mm diameter pivot bolt to improve both lever action and longevity. Making the reach for the lever adjustable to fit all sizes of riders and a nylon sleeve which allows the perch to rotate under impact are two features included that you shouldn’t have to ride without. The Elite Perch with thumb operated Hot Start has been designed and is manufactured to meet the demands of even the most discriminating rider. With all the above benefits and a heavy-duty lever cover helps protect and keep the terra firma from gumming up the works. Install one of these CNC’s front brake reservoir Caps and add some Works Connection “Factory Hardware” to your quad. Machined from 6061 T-6 aluminum and anodized in rich Blue, Red or Silver colors for a custom look. Made in the USA. Don’t be left sporting a “Plain Jane” quad. 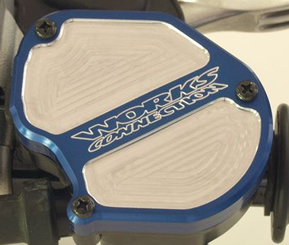 Add one of our billet Throttle Covers for an easy on the eye, and pocketbook upgrade to your ATV. Custom fit for each application and offered in rich anodized Red, Blue or Silver colors. Made in the USA. Add some style and durability to your quad with a Rotating Bar Clamp. Installs easily in place of your stock front brake master cylinder clamp with the included mounting bolts. A durable poly sleeve incorporated into the design allows the master cylinder to rotate upon impact and help prevent costly damage. CNC machined from billet aluminum.